Here at BYTE, every donation counts. We really appreciate your support, and know it’s important your money is spent wisely. That’s why we’re serious about making sure any donations go straight to our programming.Â Thank you in advance for any contribution, your generosity helps strengthen our organization and helps us reach more youth. Both one-timeÂ and repeat donorsÂ help keep our organization running. Every cent counts, so even the smallest contributions are hugely appreciated! Please keep in mind that BYTE is a registered charity so donations are taxÂ deductible. Why should I support BYTE? 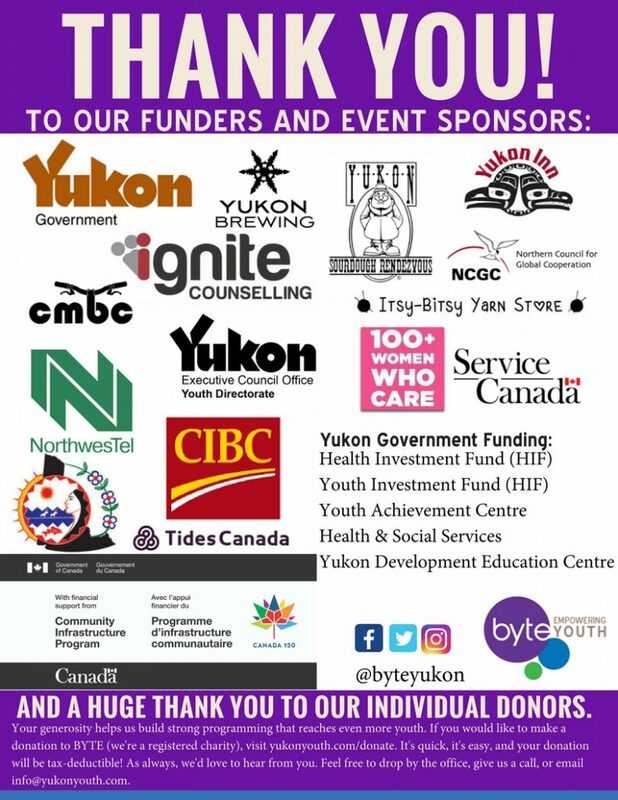 Youth in rural Yukon communities donâ€™t have the same access to programming as youth in Whitehorse do. We give young people in remote northern communities the chance to talk openly about sensitive issues with our team of expert facilitators. We work primarily with First Nations youth to help them develop confidence, leadership skills, and pride in their communities. Where will my money go? I’m in! How can I support BYTE? *Please note that donations are processed by Canada Helps. If you don’t receive a tax receipt immediately, please check your spam folder! Sign up for our monthly newsletter today and you'll be kept up to date with all of the latest BYTE news! Thank you so much for subscribing! We're excited to keep you up to date! Meet our first Leadership Award Recipient!